This is something I’ve been thinking about for a while. The cost of health care is rising everywhere, but it seems to be a particularly critical issue in the US. While the cost of drugs is a approximately 10% of total health care spending in the US, it is increasing, albeit more slowly than total health care spending. This is related to a previous post, where I commented on how it seems like every pharmaceutical and biotech company is jumping on the oncology bandwagon. One of the big reasons for this trend is that the pricing pressure on oncology drugs is relatively low. Insurance companies consider oncology relatively “untouchable”, that is, telling a mother of three that you won’t pay for her cancer drugs will cost you far more in terms of public relations than it will ever cost in terms of dollars. This is why we now have drugs like Yervoy ($120K/treatment) and Provenge ($93K/treatment). And these high prices aren’t limited to cancer. There are drugs that cost over $10,000/year in areas such as asthma, multiple sclerosis and lupus, to name just a few. Is this strategy really sustainable? The answer is no, it’s not. But what will stop this trend of ever increasing drug prices? The answer is you. You’ll simply stop paying for these drugs. You’re probably thinking “Come on! I never pay full price for my drugs! The worst case scenario is that I pay a $25 or $50 co-pay, not my problem!” That’s probably true right now, but might not be true in the future if the trend towards high deductible health plans (HDHP) continues. 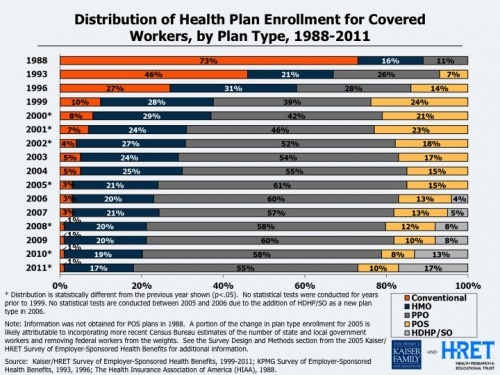 The number of Americans covered by HDHPs has more than doubled since 2008 and continues to rise (see chart below). Why? The premiums on HDHPs are often a fraction of what HMO or PPO coverage is. It not only reduces costs for your employer, but it also reduces the premiums that are deducted off your paycheck every month. What are HDHPs? Well, under typical HMO or PPO coverage, you only pay a co-pay on your prescription drugs. Depending on if it’s a generic or a branded drug, your co-pay might be $5, $10 or even $50, but that’s all you’ll pay whether or not the drug’s actual cost is $5 or $5000. Under a HDHP, you pay the full amount of your drug costs, up to the annual deductible limit (the limit includes all health care expenses). These plans are almost always paired with a health care saving account (HSA), where you (or your employer) make tax-free contributions that you can use to pay for your out of pocket expenses. So let’s say you visit your physician and he says “Mr. Smith, it looks like you’ve got a bacterial infection, might be serious, let’s put you on Zithromax.” Under the HMO or PPO plan, you might say, “Sounds good doc! Thanks!” and then run to your pharmacy and complain about the $25 co-pay. Under the HDHP plan, you’ll likely repsond “Really? How much is Zithromax? $200?!?!? Is there anything else I could take that isn’t so expensive? Amoxicillan? $4 at Walmart? Thanks Doc!!”. Of course, this isn’t a likely scenario if you have cancer, but for non-life threatening diseases, it’s a conversation I could see happening. As medical costs in general, and prescription drug costs in particular, continue to be shifted towards the patient, there will be an increased awareness on the part of patients of the costs of drugs and choices will have to be made, hopefully through consultation with physicians. So what does this mean for drug companies? The strategy of shifting from $200/month drugs for large patient populations, to $10,000/month drugs for smaller patient populations, won’t work forever. Eventually patients will start to say “This is coming out of my pocket, is there anything cheaper?” and drug companies will be facing real pricing pressure, across the board. It’s a challenging situation to be in for drug companies since producing safe, effective drugs is an expensive process. However, eventually another strategy (lower priced drugs) will have to replace the current one. That’s going to require more than just a shift in strategy by the drug companies, it will require a complete reappraisal of how patients, physicans, insurance companies, the FDA and drug companies view value and risk. I’ll be honest and say I have no idea what the drug industry will look like in 10 or 20 years. However, I do know that the drug companies that will be on top are the ones planning for this future right now.